We’d love your help. 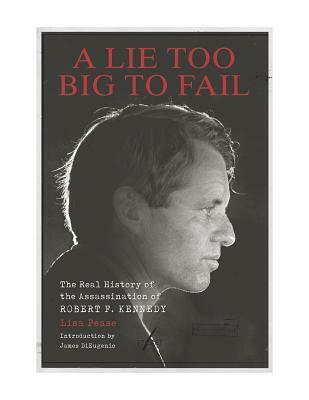 Let us know what’s wrong with this preview of Lie Too Big to Fail, A; The Real History of the Assassination of Robert F. Kennedy by Lisa Pease. In A Lie Too Big to Fail, longtime Kennedy researcher (of both JFK and RFK) Lisa Pease lays out, in meticulous detail, how witnesses with evidence of conspiracy were silenced by the Los Angeles Police Department; how evidence was deliberately altered and, in some instances, destroyed; and how the justice system and the media failed to present the truth of the case to the p In A Lie Too Big to Fail, longtime Kennedy researcher (of both JFK and RFK) Lisa Pease lays out, in meticulous detail, how witnesses with evidence of conspiracy were silenced by the Los Angeles Police Department; how evidence was deliberately altered and, in some instances, destroyed; and how the justice system and the media failed to present the truth of the case to the public. Pease reveals how the trial was essentially a sham, and how the prosecution did not dare to follow where the evidence led. To ask other readers questions about Lie Too Big to Fail, A; The Real History of the Assassination of Robert F. Kennedy, please sign up. Ms. Pease has written a thoroughly researched work on the Assassination of Senator Robert F. Kennedy. She provides interviews of the witnesses as recorded shortly after the event. She then includes several of her interviews with these same witnesses years later. Ms. Pease has provided the documents from the State of California Archives regarding the LAPD, the LA Sheriff’s Office, and the FBI investigations. Her research includes that of the trial, guilty verdict and subsequent testing of Sirhan Ms. Pease has written a thoroughly researched work on the Assassination of Senator Robert F. Kennedy. She provides interviews of the witnesses as recorded shortly after the event. She then includes several of her interviews with these same witnesses years later. Ms. Pease has provided the documents from the State of California Archives regarding the LAPD, the LA Sheriff’s Office, and the FBI investigations. Her research includes that of the trial, guilty verdict and subsequent testing of Sirhan Sirhan in prison years later. Her research and documentary evidence prove that Sirhan could NOT have killed the senator as Sirhan was IN FRONT of the senator. All wounds to Senator Kennedy were received from the BACK as detailed in the autopsy made public. Also, the evidence proves that the bullets in storage could not have been fired by the gun Sirhan used. Here is a book that tries to verify each statement and conclusion with solid evidence. Most of this evidence has been hidden from the public for years. In presenting the story of the Assassination of Senator Robert F. Kennedy, Ms. Pease has provided a vital history of the 1950’s, 1960’s and that of the Central Intelligence Agency during the same time. This work should be in every public library and required reading for all high school and college students. Every adult should read this book within the next twelve months. "I stood on the shoulders of giants when I started to look into this case." I have read everything from Kaiser, Turner/Christian, Melanson, O'Sullivan, Faura to Tate/Johnson and if Lisa Pease has stood on these shoulders, she has gained a clear unobstructed view of the assassination of Robert F. Kennedy. She writes, "That's why I wrote this book. I knew no journalist would give up 25 years of their life to learn the truth about this event. But the way the CIA took over America in the 1960's is th "I stood on the shoulders of giants when I started to look into this case." I have read everything from Kaiser, Turner/Christian, Melanson, O'Sullivan, Faura to Tate/Johnson and if Lisa Pease has stood on these shoulders, she has gained a clear unobstructed view of the assassination of Robert F. Kennedy. She writes, "That's why I wrote this book. I knew no journalist would give up 25 years of their life to learn the truth about this event. But the way the CIA took over America in the 1960's is the story of our time, and too few recognise this." James W. Douglass writes the definitive review on the rear cover of this book. "Lisa Pease has written the magnum opus of RFK assassination research...Pease presents here the overwhelming case for the defendant's innocence--and the government's guilt--that the jury and public were blocked from hearing...This was indeed a lie too big to fail...until now." What you go and do? You go and give the boy a gun. ain't no place to run. Head still spinning & buzzing but the main takeway for now is that it was even better than I hoped and I hope that the recent Washington Post article (https://www.washingtonpost.com/histor...) begins a snowball effect in terms of visibility. The meat & potatoes in terms of the assassination mechanics were already ridiculously well done, but the chapters Mind Games and Mission: Possible are just... wow. I got quite emotional, actually. The description of the evolution of mind control techn Head still spinning & buzzing but the main takeway for now is that it was even better than I hoped and I hope that the recent Washington Post article (https://www.washingtonpost.com/histor...) begins a snowball effect in terms of visibility. The meat & potatoes in terms of the assassination mechanics were already ridiculously well done, but the chapters Mind Games and Mission: Possible are just... wow. I got quite emotional, actually. The description of the evolution of mind control techniques in Mind Games is quite horrific and seriously creeped me out like a horror novel. The last chapter is simply essential historical synthesis and revisionist history at it best. This assassination was even more blatantly a conspiracy than the JFK case. Typos, all over the place. Some sentences repeated. Great info. The author is left leaning and it would of been nice if she was was more of a Centrist or Independent. Submitted by a former Republican now Independent who hates the Deep State both left and right. Truth can set you free, but not always. A well titled book with full documentation. This well take more than one reading to fully absorb the entangled web of deception created by the agent spiders of self-interest. This is a very important book that everyone should read. History should reflect the truth and not a lie and most Americans do not know the truth about the RFK Assassination. Thoroughly well-sourced account of Robert F. Kennedy’s assassination. Pease spent 25 years interviewing witnesses and poring over documents. This book convincingly debunks the case for Sirhan Sirhan as the assassin. It is well-worth your time if you have any interest in the assassinations of the 1960s and an accurate recounting of history.